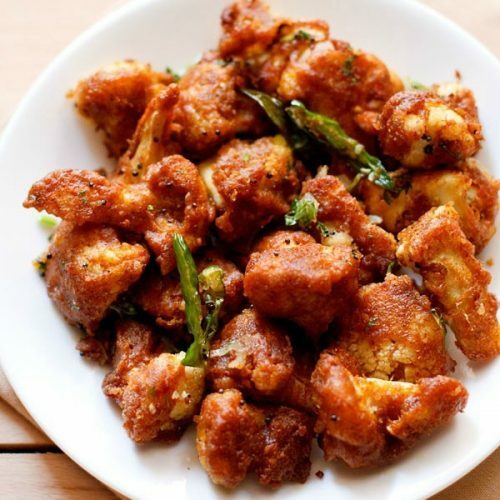 gobi 65 is a spicy and tasty starter snack of fried cauliflower florets. chop 350 grams cauliflower in small pieces. rinse them very well and keep in a bowl. now add enough hot water so that all the florets are covered. cover and blanch the florets for 20 minutes. in a small bowl, add 1 to 2 tbsp water and soak 4 dry red chilies in it for 15 minutes. in a small grinder jar or chutney grinder, add 1.5 tsp chopped garlic and 1.5 tsp roughly chopped ginger. add the soaked red chilies. add 1 to 2 tbsp water and grind to a smooth paste. keep aside. drain the gobi florets well and take them in a mixing bowl or pan. add the red paste. mix very well. then add 6 tbsp besan, 4 tbsp rice flour and 2 tbsp corn starch. add ¼ tsp turmeric powder, ½ tsp red chilli powder, ½ tsp garam masala powder and ½ tsp coriander powder. also add ½ tsp lemon juice. then add 1/3 cup water. next add salt. mix everything very well. cover and allow to marinate for 30 minutes. heat 5 to 6 tbsp oil in a kadai. when the oil becomes medium hot, place the batter coated cauliflower florets in the hot oil. fry one side and when it becomes crisp, turn over and fry the other side. fry them evenly, till they are golden and crisp. fry them in batches. with a slotted spoon, remove the fried cauliflower florets and place them on kitchen paper towels to absorb extra oil. now remove the extra oil from the kadai and keep 2 tsp oil in it. add 1/2 tsp mustard seeds and crackle them. then add 2 to 3 dry red chilies. saute till the dry red chilies change color. next add 1/4 cup chopped onion, 1 tsp finely chopped garlic, 1 tsp finely chopped ginger and 5 to 6 curry leaves. then add salt as per taste. you can also add a pinch or two of sugar. mix well. add the fried cauliflower florets. switch off the flame. toss and stir the whole mixture. add 1 tbsp coriander leaves. mix well and serve gobi 65 with coconut chutney, coriander-mint chutney or even tomato ketchup. you can also serve some chapatis or bread along side.